Are You Ready for the Gorilla Challenge? The event is a combination of physical and mental challenges. You’ll decode clues about D.C. while racing across downtown in order to win prizes. The key to winning this Amazing-Race-meets-Fear-Factor race is solving the clues, mapping them out, and taking the shortest distance to each checkpoint. Challengers can also participate in a fun costume competition! Prizes will be awarded to the first, second and third place competitors who complete the challenge. Challengers who bring the most non-perishable to donate to the Capital Area Food Bank, as well as the winners of the costume contest, will also receive rewards. Time: Arrive at the starting point at 9:30am for the 11:00am start. The Gorilla Challenge lasts 3 hours. 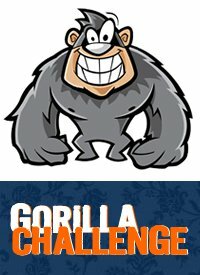 Registration: Visit http://bit.ly/GorillaChallengeDC (Calvary supporters can get a special discounted $25 registration by entering the code “ilovecalvary”). Volunteering: If you want to volunteer at the event, email us at: info@calvaryservices.org.